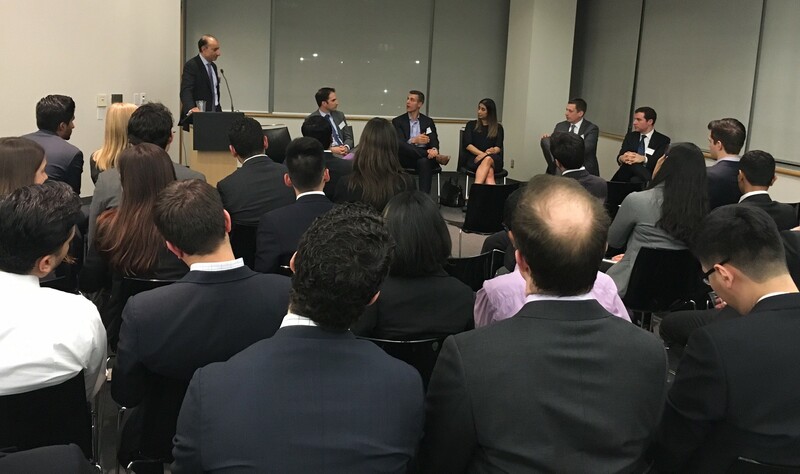 Greybrook Securities Inc. CEO Sasha Cucuz spoke at last night’s Rotman Real Estate Association Investment Night as part of a panel led by Robert Gill, Senior Vice President of Real Estate at CIBC, and included several Toronto real estate and financial industry representatives. The panel focused on real estate assets from the perspectives of investors and asset managers, and included discussions around financing, risk and return considerations. Cucuz spoke to Greybrook Realty Partners’ investment strategy and their disciplined approach to underwriting. In particular he discussed the importance of selecting the right development partner for each project and commented on the firm’s deal origination philosophy and how working solely with large, tier 1 developers has enabled access to some of the residential sector’s most coveted deal flow. The panelists then discussed the current challenges and constraints facing the real estate sector and spoke in detail regarding such issues as cap rate compression in the commercial/retail market, the meteoric rise of land values in Toronto, the tightening of development margins, as well as the public markets’ response to the repricing of risk and the many challenges facing public REITS as they raise equity in a difficult Canadian market. Further, Cucuz explained the importance of identifying risks in evaluating opportunities and ensuring that equity’s compensation for bearing risk is adequate throughout the various real estate asset classes. The discussion concluded with each panelist offering advice to the Rotman students hoping to work in the industry, before attendees and panelists networked for the remainder of the session. Sasha Cucuz responds to a question from moderator Robert Gill.